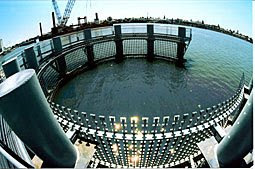 It has a diameter of 50' and thousands of small stainless steel mirrors cover the circular pier. These are angled down to reflect snapshots of the surface of the bay and create the impression that the surface of the water has been digitized. 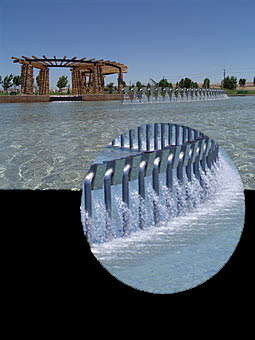 It consists of a 100-foot long curve of custom designed nozzles that spray thin sheets of water down into a lake. The 1/8th-inch thick, glasslike sheets of water move like fabric in the wind and are very responsive to light. 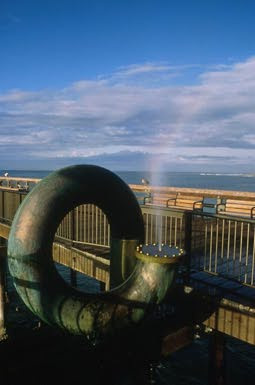 It is a fountain that uses the energy of ocean waves; the air pressure surges from passing waves sprays seawater out of the spiral structure. 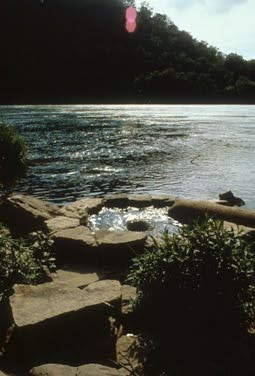 Water from the Niagara river entered this six-foot diameter, spiral-shaped, stone basin. It was constructed of granite found on the site.